4 pp. Roman, 87 pp. The present study is concerned with traditional healing practices and the concept of health among the Akan of Akyem in Ghana. 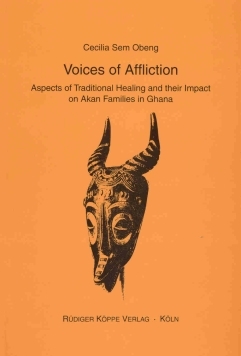 It details the different types and practices of healers against the historical and socio-cultural background of the Akan. In contrast to the view that traditional societies like the Akan explain and treat illnesses exclusively on a spiritual level, Cecilia Sem Obeng shows that the Akan indeed have a bipartite concept of illness, caused by either physical or spiritual circumstances. Drawing on three extensive case studies and numerous interviews with patients, their families and the healers, the author explains the process of treatment of so-called spiritually caused illnesses. Another three case studies circumscribe the distinctly separated illnesses caused by physical reasons. Both kinds are then considered in the context of the Akan’s view on health and disease. The study is especially valuable because the author herself is an Akan. She grew up in the village of Asuom-Abompe in Ghana. During this time she participated in treatment processes and got well aquainted with several healers. She later trained in Akan traditional oral literature in Legon and studied folklore theory and practice at Indiana University/USA, both of which now enable her to weigh and analyse the narratives of the local inhabitants with empathy and scientific soundness.